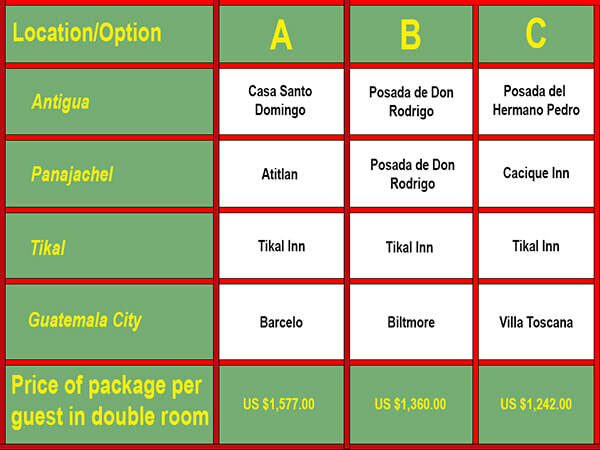 ​Guatemala Mayan World Experience Package price is based in the table below:. ​Guatemala Mayan World Experience Package:. Welcome at the international airport. Transfer to La Antigua, Guatemala. After breakfast you will head to La Plaza Central, El Palacio de Los Capitanes Generales, The Cathedral, Church of San Francisco El Grande, The Capuchinas’ Convent, Hotel Museum Casa Santo Domingo, a fabric specialized in jade and silver. You will continue visiting the lovely towns of San Juan del Obispo and Obispo Marroquin’s Monastery, San Pedro Las Huertas and its public pilas. Also will visit Ciudad Vieja which was the 2nd Capital of Guatemalan Kingdom; San Antonio Aguas Calientes, which is famous because its handmade textiles; also you will visit a Macadamia plantation. 5:30am You will leave the hotel and head to the Guatemalan plateau, Panajachel, which is the main town in front of the Lake Atitlan, from there you will take a boat and will visit 3 towns on the other side of the lake, San Juan La Laguna, san Pedro La Laguna and Santiago Atitlan. The traditional clothes are to be seen in all its splendor in this region of Guatemala. In Santiago Atitlan, men use white shorts with purple vertical stripes, long sleeve shirts and a hat. Women wear white huipiles with geometric draws, a red circumference and some precious reliefs. Chichicastenango Market (market days are Thursdays and Sundays). After having breakfast you will head towards the famous open market of Chichicastenango and the Church of Santo Tomas, where you could walk around the area and watch the admirable craft art from the locals, as well as buy some of what they offer. The colorful market filled with incense perfumes and mysticism promises a unique atmosphere in which bargain is part of the culture, the church in Chichicastenango shares the Mayan and Catholic rituals and traditions. Every Thursday and Sunday the market appears and then disappears as one of the ancestral comercial tradition in the highlands of Guatemala, that nowadays entertain its visitors. You will visit the historic part of the city: The National Palace, Buildings belonging to the Guatemalan Bank, Municipality and National Theatre. Then you will head to the Relief Map and visit the residential and financial area. In the afternoon you can choose to visit either the National Archaeology and Ethnology Museum, or Ixchel and Popol Vuh. At the agreed time you will be transfer to the International Airport and wait for your flight back home.